4.0 out of 5 based on 96 bloggers and 35 commenters. 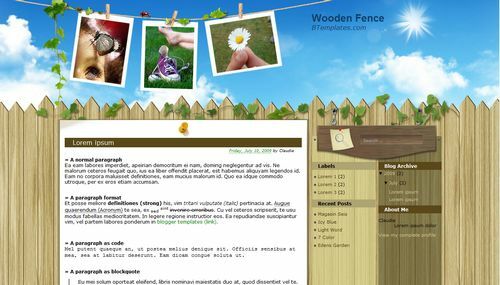 Wooden Fence is a free blogger template adapted from WordPress with 3 columns, right sidebar, fresh look and grunge style. Excellent template for blogs about art, to write a diary, nature or photography. Nice, with sharp colors. I like it. how do i become a registered user! hi, i really dont understand why i cannot extract the templates. After extract, it has to file Read me and woodened fence. xml, but i couldnt open xml, what is wrong? The search button doesn’t search my blog but sends me to this website http://demo.templatelite.com/?q= how do I change this? kathy, this is how i do it..after you download, the read me and the woodened fence. xml will appear, save it. then you the right click the woodened fence.xml- open with notepad, then you copy the code and paste in edit htmlof your blog.. hope it helps.. I like the template too, but on my site as well there is no date showing, only the time. I have tried changing the date format, but have as yet to find one that ends up displaying the date? Help? I’d really appreciate it if someone could tell me if there’s a way to replace the photos in the header (hanging from the clothespins) with my own photos. I am a photographer and absolutely LOVE this template, but want my own photos in the header. vic, can you tell me how to upload the photo and edit it in more details? i am newbie in these…. I want to upload my own images also (hanging from the clothspins). I need more help than what was told Misty also. I keep replacing the entire header… help please! Thanks! P.S. I really do LOVE this template too! Obrigada por disponibilizarem este Template. Eu utilizo e meu blog fiou muito bom. Ainda não sei mexer totalmente neste recurso, mas o visual ficou ótimo. how will i change the pictures hanging on the clothespin? Can you please explain in detail how to place the pictures..the instruction for misty is lacking or maybe vague. Love the template but i might just have to replace the template if the pics can’t be replaced.. I also like this theme. But with my own pictures. many thanks for your explanation. I’m almost there I believe. For those who are having trouble with their image showing up too small/not in the right place, I figured out that photobucket for some reason won’t save the file as large as it was. So, it’s showing up with only 600 pixels wide or so. Next, if I don’t use Larabelle’s suggestion, and upload using the header edit button (use this image instead of your title option), it shows up slightly off from lining up. Same problems with sizing. Finally, my search bar still doesn’t seem to work, even after checking, and double checking the code, and replacing the code with my own website. It just brings up the homepage again! Any and all suggestions are helpful. :-) Thanks all! I too am having trouble with displaying the header picture once I have put my own photos in. It’s way too small. Any and all suggestions are helpful.Thanks! I have been following along, trying to fix some problems I am having with the header picture, as well. Couldn’t get the code to paste in comment form. Please check website. That’s it.. sometimes it takes too much time to load coz i mistakenly chose high quality of image in photos hop i think. I LOVE YOU!!! I was about ready to give this darn template the boot, and then I found your post! Your search & date format tips worked like a charm! And, they were So simple!! !Thanks again!!! Thank you chubbymommymye, imageshack solved my problem! I had about given up. how to adjust the width? the sidebar? the post?